Johanna Sinisalo holds her Prometheus Award. (Photo by Ryan Lackey). The Paris Review has a new article up, “How Finland Rebranded Itself as a Literary Country,” which purports to tell the story of how Finnish writers have acquired an international reputation. But the article’s author, Kalle Oskari Mattila, seems to be determined to make sure that neither the science fiction community nor the Prometheus Award will receive any credit for the growing attention to Finnish writing. The article includes a photograph Johanna Sinisalo and a brief description of her novel, The Core of the Sun. But it doesn’t mention that she received the Prometheus Award in 2017 for the book — likely the first time the award has gone to someone who isn’t an Anglo-American author. Similarly, the article leaves out the fact that Sinisalo was one of the guests of honor for the first-ever Finnish worldcon in 2017, which drew 7,119 people. 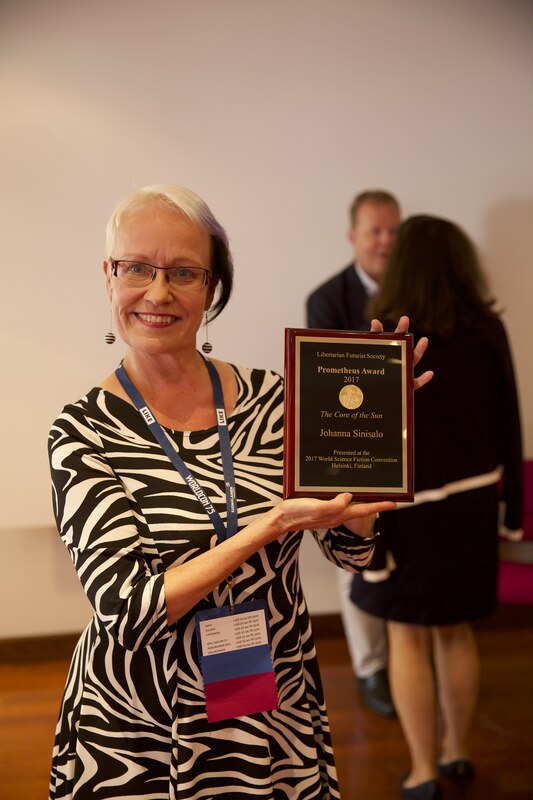 Sinisalo was given her Prometheus Award at the convention, and the award helped demonstrate that she was a guest of honor on her merits, and not just because she happens to be Finnish. The worldcon was one of the biggest ever in terms of attendance and certainly helped shine a spotlight on Finnish writers. Review (actually published in New York) apparently wants to take it into the 21st Century.